We were barely out of room number one at the Panic Room before it was time to head back in for some more horror. 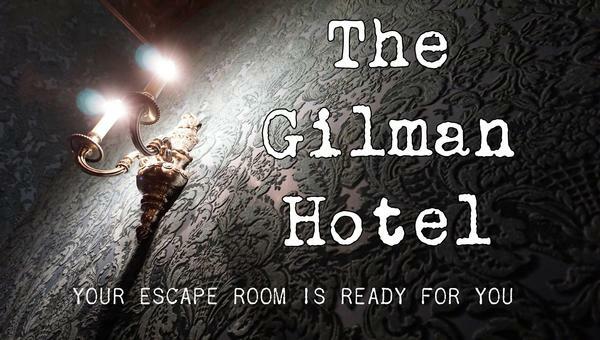 Next up, we’d booked a relaxing stay at the Gilman Hotel. A private investigator had been looking into the disappearance of important occult artifacts in a derelict coastal town. You lose contact with him so head there yourselves but by the time you arrive night has fallen so you find lodgings in The Gilman Hotel. The start of this room is a masterclass in how to leave players unsettled in a game. They throw you into the experience, leave you uncertain what to do and then, just as you’re starting to find your feet, they throw something entirely unexpected at you. The start reminded me a little of Enter the Oubliette‘s game, and that’s no faint praise. So, it’s deep into the immersion from the beginning, and that’s backed up by a set that’s been lovingly created to render an old-world hotel and a story that expands throughout the experience. I particularly liked the way they kept adding in small references here and there to fill in the narrative without you having to take on a mass of information. The one place where the immersion broke down for me was in a part of the game that I can’t really describe without giving away spoilers. In abstract, there was a conflict between us very clearly being candidates for murder and yet being allowed to continue on our merry way without fear of retribution. That’s not an unusual occurrence in a room, but here it grated more than in most. For most players, that didn’t seem to even register so, unless not breaking immersion is something that you focus on, you’ll likely not even notice. The individual puzzles weren’t the most exciting in the world. Often they were just spotting pieces of information, and rarely was the challenge in getting the solution. Their strength lay more in them generally not being arbitrary puzzles placed in the room. Clearly, an effort had gone into making sure that there was a reason for their existence. The puzzle path was well constructed, with an overarching mission to rescue six artefacts. As the game progresses, your retrieval of those artefacts gives you a good way of measuring progress as well as providing teams who are struggling with an option to escape without having completed every element in the game. They’re impressive artefacts too, lovingly created, and an aspect of the game I really loved was that you have to carry them out in an old leather satchel. Many games require you to retrieve certain items but then use them to produce a code to exit the game. The simple act of carrying them over the threshold made a big difference to the immersion for me. Our team of three escaped after 53 minutes with three or four clues – one requested and the others when the GM felt they were necessary. Clues appear on the grandfather clock, which means they’re not always easily visible. However, an audible chime means that it’s always clear when one has arrived. We chose to play with the immersion in this game, and the escape time reflects that. This was no more difficult in my opinion than any of their other games. The Gilman Hotel is all about immersion, and they’ve done well to craft a room that tells a story in the background as you’re solving puzzles. Indeed, this is probably the most immersive of all their experiences but, for me, that immersion stumbled very slightly. You could play this with just two players if you really needed to, but the immersive nature makes it more suited to larger team sizes than most, and I’d suggest it could cope with up to around six players and still be plenty of fun. Aside: a highlight of the weekend was when one of the owners walked in and caught the tail end of a teammate saying “It was a terrible hotel – if I went on to TripAdvisor I’d probably give it one star”.